Josh Warrington says IBF featherweight champion Lee Selby is trying to turn him into a "villain". 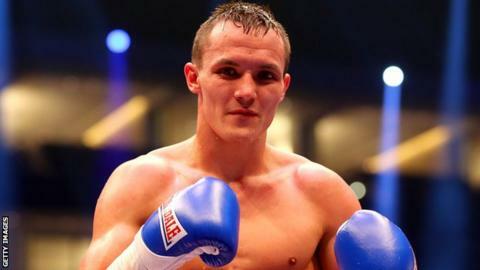 Warrington, 27, is mandatory challenger to fight Selby, 30, but says they have been unable to come to an agreement. "He's trying to turn me into the villain. He says that I'm obsessed and I can't let him go and things like that," said Warrington. "The lad has never given me any credit or respect." Lee Selby retained his IBF featherweight title with a unanimous points decision over Mexican Eduardo Ramirez on Saturday night. Warrington, who is undefeated in 26 fights, was ringside and says there is no lack of desire on his part when it comes to making a fight with the Welshman. "His team went overboard on the stick they were giving me last year when I had to cancel my wedding a few times," added Warrington. "I said to my manager if we could make the fight for late 2016 then perfect and I was prepared to lose 15 to 20 grand on deposits for my wedding to fight him. His team didn't respect that. "He has always been in front of me and I've always wanted to fight him but I've not done it by going to the cameras and calling him out. The 9st division is one of the most competitive in boxing at the moment and Warrington is keen to fight the best. He added: "For Leeds and Yorkshire, the Lee Selby fight is the one everyone wants but the division is buzzing with the likes of Carl Frampton, Scott Quigg and other top fighters based in America and it's a pleasure to be amongst those names."